Imagine the upheaval for customers when a busy national bank branch in a busy community area--currently open seven days a week--is faced with the real possibility of shuttering their doors due to structural decline. That’s exactly the situation a popular branch in Illinois recently confronted. The news that the east wall of the building was buckling meant the roof may also be compromised. Officials feared the roof might eventually collapse. The bank had to act quickly to find a solution strong enough to stand up to the heavy snow that would blanket the rooftops during the winter. In a bustling community, banks are hubs of business for consumers and companies alike. Customer retention and loyalty are key metrics to consider when calculating the success of a bank. How could the bank continue to deliver a world-class customer experience under the circumstances? A forensic restoration consulting firm and a regional construction firm specializing in masonry and concrete were contracted to stabilize the structure. 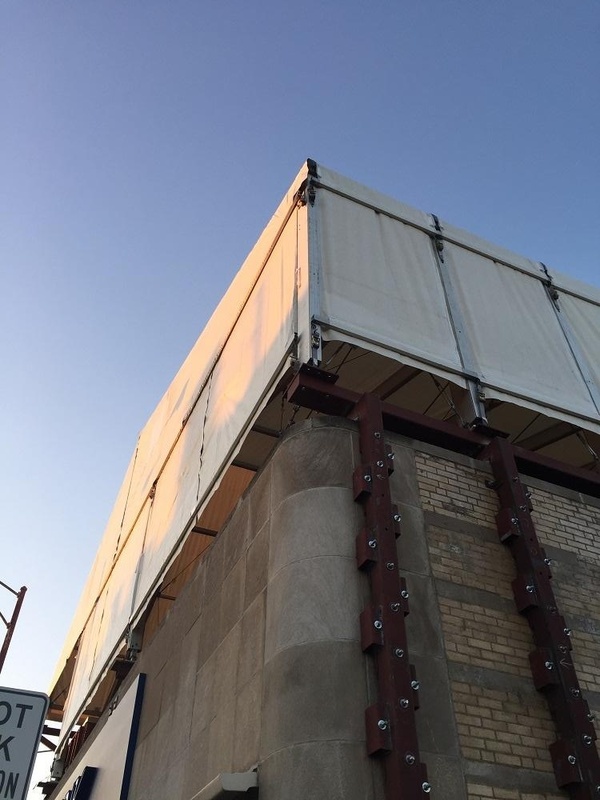 The bank needed an additional partner who specialized in customized temporary structures to cover the roof keep additional loads off the sagging wall. The Mahaffey team was asked to join based on the customer’s research, Mahaffey’s decades of experience, professional team and reputation in the industry. Foot traffic was heavy in the branch, and the bank was determined to maintain their banking hours. They requested Mahaffey’s help with a safe, reliable plan of action to cover the bank’s roof. The roof’s purpose was to cover the damaged side of the building and help manage snow load during the area's notoriously harsh winters. 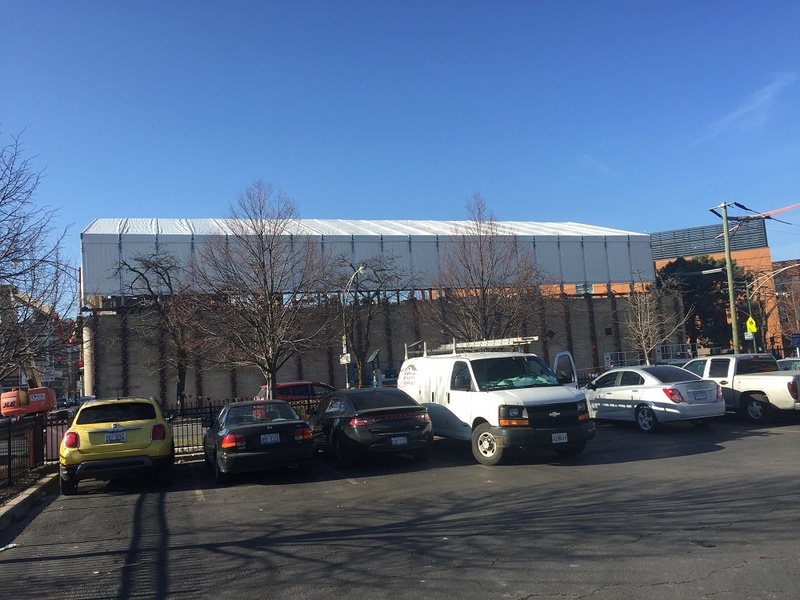 The temporary roof would remain for a year or more on the site while plans for a permanent building at a new location were finalized. The roof structure would have to be sturdy enough to keep snow loads off the already at-risk roof. Additionally, Mahaffey was tasked with providing support for the restoration team’s pulley and cable system designed to transfer load from the weakened east wall to the west wall. 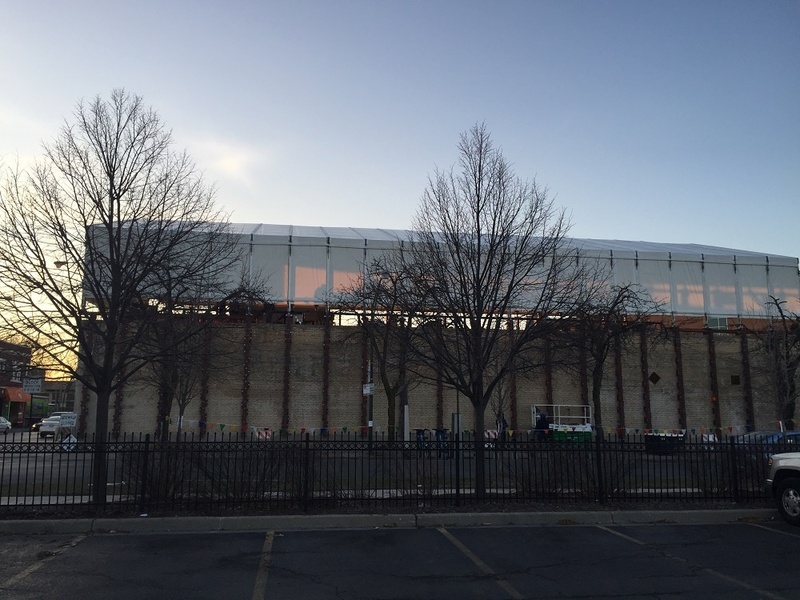 The frame for the temporary structure is installed. The project required intense collaboration between Mahaffey’s engineers, project managers, designers and the bank’s consulting firm engineers and designers over the coming months. Planning began in 2016 and would require a year-long collaboration among vendors to produce the proper design for the roof structure as well as customized elements critical to the structure. Mahaffey proposed a customized MegaStructure™ series tent. Once installed it would encompass approximately 7200 sq. feet of the bank’s roof. The MegaStructure™ is an aluminum box beam structure and is rated to be used in areas prone to extreme weather conditions. This industrial fabric structure is best suited for semi-permanent applications of at least three months and is ideal for industrial projects, and those applications located in areas with harsh climate conditions. Even with the inherently strong physical properties of the MegaStructure™, Mahaffey’s team included a greater number of trusses for better support and to adhere to permanent building code guidelines. Mahaffey’s fabricators created custom foot plates according to custom design specifications which allowed the structure’s uprights to move slightly relieving loads on the east wall. Additionally, Mahaffey resized the roof structure’s fabric so the bottom did not touch the ground, allowing better airflow underneath and preventing heat buildup. Mahaffey’s team worked closely with the client to plan how to best complete this installation without disrupting business. 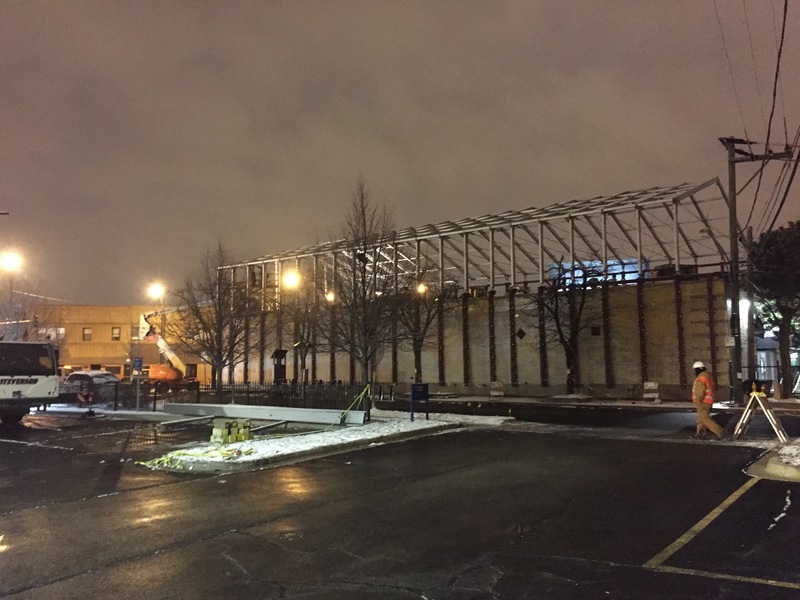 The Mahaffey team worked out a flexible schedule to allow crane operation to take place after business hours, ensuring the safety of customers and crew. The installation was set to begin December 1, 2017 on top of a two-story building. Wintertime in this area always brings plenty of snow and ice but the Mahaffey team worked efficiently even in harsh conditions and successfully completed the job within two weeks. The completed structure served to relieve the original roof of its snow load capacity and proved structurally durable and sound. The branch remained open throughout the process. Overall the project served to help the customer avert disaster in the future and allowed them to maintain ‘business as usual’ in the meantime. Today, the current branch is secure and safe for daily customer traffic. Many industries rely on us to provide business continuity solutions. We offer solutions such as temporary shelters, classrooms, living quarters and in this case, a temporary roof to help provide structural stability and a safe place to conduct banking business. Mahaffey knows your industry and you can count on us to listen to your needs and make recommendation based on your goals. Contact one of our Project Managers to discuss your company’s needs today.